Swords & Stitchery - Old Time Sewing & Table Top Rpg Blog: Another Free Old School EC Science Fiction Classic Comic Download - "Judgment Day!" (originally in Weird Fantasy #18). 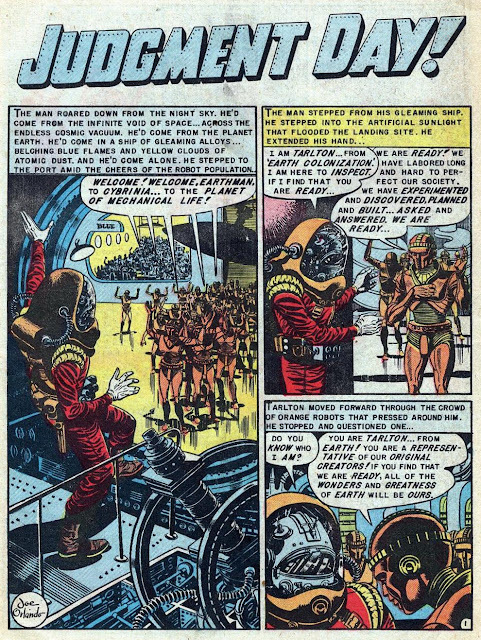 Another Free Old School EC Science Fiction Classic Comic Download - "Judgment Day!" (originally in Weird Fantasy #18). One of the all time calls is Judgement Day! that EC comics ran, this was an adaptation of a story by one of my favorite authors Ray Bradbury. 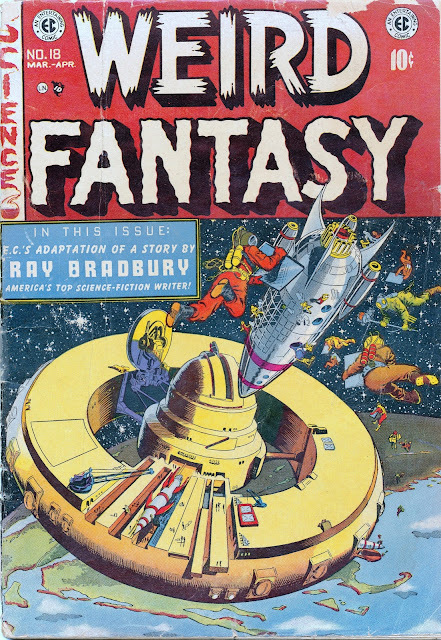 EC's March-April 1953 issue of Weird Fantasy includes a 7-page story titled "Judgment Day", written by Al Feldstein, drawn and inked by Joe Orlando, and colored by Marie Severin. Everything about the comic was a flat out classic, from the biting commentary back in '53 to the wonderful artwork. The layout and everything is classic EC and very biting social commentary from a time when social and cultural racial revolution was only another ten years away. Good science fiction not only entertains but runs the rails of society. This story is also a good study in cultural byways and norms for a DM doing a science fiction campaign. You want to know the inns and outs of looking a society bathed in the cultures of prejudiced and backwards thinking, this is one to look into. I look at these stories as classics of science fiction and they're perfect fodder for a classic Traveler or X plorers campaign. The presentation, execution and more are solid EC science fiction material. Because of my connection to England with friends and family the blog reference article was especially interesting for me to read and gives a cultural prospective as well in a much more modern and personal sense. So this isn't merely a case of reblogging and flogging the material here. Please check this one out folks and I love the last EC twist punch to the gut panel as well.